One feature common to almost every website in the world is the contact form. It can be used to collect feedback, complaints or useful information from website clients and users. A typical contact form consists of the following fields – sender name, sender email address, email subject and the message. In this tutorial, you will learn to build a simple contact form with a WordPress plugin. The contact form PHP class will consist of a property and six methods (known as “functions” in procedural programming). The private property $form_errors is an array that will store all the errors that will be generated by the contact form. I will explain what each class method does as we walk through the coding of the contact form plugin. Like other WordPress plugins, the header is first thing to go into the plugin file. Below is our contact form header followed by the class declaration and property. The contact form will be embedded in WordPress via shortcode [contact_form_dm]. The magic __construct() method handles the registration of the shortcode so it is recognizable by WordPress. The contact form HTML code will be in the static form() method. No form field is unfilled or empty. The sender name is not less than four characters. To keep things simple and succinct, we will stick to the above validation rule. Below is the code for the validate_form method. The send_email() method sanitize and send the mail to the administrator email address. Take note, mail will be sent to the blog administrator or owner’s email address programmatically retrieved by the WordPress get_option function. The send_email() method ensure there isn’t any contact-form generated error before sending the email. Next is the process_functions method. This method call and process the form, validate_form, send_email methods. Firstly, the method check if the contact-form has been submitted. If true, it call the validate_form to validate the form values and display the form generated message. The send_email is also called to send the email to the administrator. Finally, the form to display the contact-form HTML form. The second argument passed to the function is the shortcode callback method shortcode(), which is called when the shortcode is used. The class would be useless if it isn’t instantiated. Finally, we instantiate the class to put it to work. Below is a screenshot depicting a message has been successfully sent via the contact form. A lot of contact form plugins in the WordPress plugin repository are quite heavy and bloated. If you have been considering rolling out your own, this tutorial showed how to build a simple contact form. 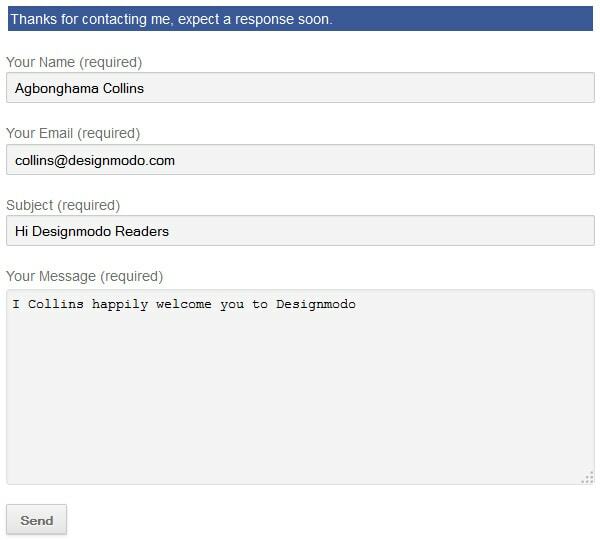 Here is the link to the designmodo contact-form plugin just in-case you want to use in your WordPress site and also study the code to learn how it works. If you have any questions, or suggestions for code improvement, let me know in the comments. They might make you lazy but you should consider security and best practice. Sanitization and validation are a bunch of stuff that have to be done and doing them over and over again for each site takes a crazy amount of time. Good plugins take this into account as well not just display 3 fields. I am glad you found this tutorial helpful. Don’t hesitate to let me know when you encounter any difficulty. For some reason this is not working for me… I tried adding for my index.php and my page.php. I also tried installing the plugin directly from the download with no changes made. The short code just shows the short code text it does not show the actual form. Hi, this is a WordPress plugin and not a plugin for any PHP web application. For some reason the thank you message is displaying at all time. When I submit the form it shows the thank you messages correctly with the blue div around it, but when I haven’t it shows just the thank you message. Glad you figured out the cause of your problem. I would love to use this instead of the bloated Contact Form 7. I’ve copied the code directly from the zip file into my own functions plugin, and it looks promising but I can’t seem to get it to work. I tired an alternative email, and entered test text but nothing is coming up in my inbox. Any ideas? Also, how to remove the always shown “thank you text”? I see Gidone suggested removing the other two echo lines, but that causes a fatal error. I tried to post a link to the page but it kicked it off as spam. It’s frustratednerd com / contact if interested. How I can import my own css file without http link? Could you please help me, point me to the right direction how to implement datepicker (js), how to process, handle and take data out of it and include the chosen date into the email. Thanks for the tutorial. Have 2 things I’m trying to figure out: where specifically in the code is the subject that appears in the recipient (I edited to deliver directly to an email address) subject line as I wish to have a fixed subject line. 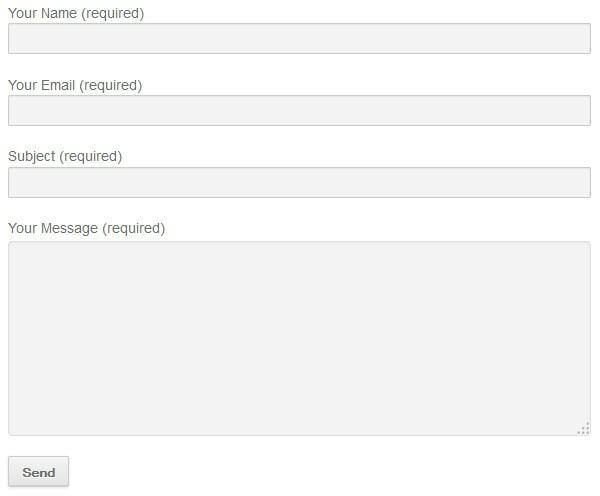 Second is if it’s simple to enable a feature to allow for the user to choose between multiple addresses for the form to be sent to? When changing confirmation method from echo to a redirect using header(“Location: “) I get a problem with buffer flushing and generating “headers sent” error. It has to do with buffer exceeding 4kb size. Enabling unlimited buffering fixes the problem, but I wonder if there is a fix for the code which will make it work without changing php settings? A clean tutorial to create a contact form. It’s so good to see a well structured clean coded tutorial about a contact form. This allows me to avoid overkill plugins, thank you so much. 2. a feature request: maybe include a recaptcha? It’s not a mistake. Just this problem is not affected in this decision. To avoid resubmission, you must reload the browser page using the GET method in case of successful form submission. For this, there is a function wp_redirect (). But it’s unclear where it can be hooked.